More and more women in India are becoming victims of murder on grounds of unpaid dowry, or simply thrown out on account of husband's desire for another woman, subject to physical ill-treatment, blows, harassment and rapes. A number of social action groups retaliate in the form of seminars, articles, demonstrations, lectures, meetings, books, tracts, declarations. Unfortunately, in India, the majority of groups and associations intervene from and in an urban milieu, recruit their activists from educated middle class women, speak a language of liberation of urbanised women which hardly has roots in the culture of common women. 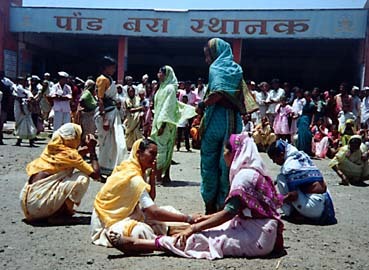 Most often, these women once ill treated or deserted remain too isolated and defenceless in front of such practices, except when such urban groups get around in order to intervene on their behalf, take care of and follow their cases before the court, or at least advise them about rights and legal procedures. Nevertheless, the solutions recommended or implemented often hardly take into account the actual socio-cultural constraints imposed on the common people, nor the traditional forces that control the civil society with more force and authority than the modern laws of the legislators. Sometimes even the strategies draw inspiration from feminist and economist ideologies which have no impact. Besides, these interventions, their mode of implementation, their conception and the concrete decisions are steps that do not fully incorporate humble women in distress in the handling of their case with full and equal initiative. In the end ripostes and tactics float above the hard social and cultural realities and are hardly favourable to the emergence of a truly popular mass movement of the concerned women. Since 1992 the rural peasant women animators of the GDS (Organisation of the Poor from the Mountain) have presented a street play, all written by themselves. Dialogues, songs, and scenario with no written text expose the basic reasons for the rejection of wives by their husbands -- such as they see and analyse them. The whole direction is their own collective creation. When this play was staged at Aurangabad in 1994, the audience listened to and followed the play, flabbergasted. Women from the audience were visibly upset by the scenes from life that were presented. Many of them, who had come from areas that were far away from each other in Maharashtra, sang in chorus along with the actresses, the songs of the millstone that the latter had taken up for accompanying and commenting on the scenes that they presented. Why such an impact? You are women like us, poor, peasants, without education. What could you have done to gain so much boldness, climb on a stage, exhibit and play the role yourself, speak as you do, sing traditional songs, show how one dances in circles on festival days? When you sang the opening phrases of the songs of the millstone, we knew them all by heart. We said to ourselves that this is not a play at all; we were not at Aurangabad, but we were at home, in the village, in the slum. We were seeing and living our everyday life again. It is not a play that you are showing, it's the reality. A number of women in tears were incapable of saying a word; their hands were shaking. They found it necessary to touch each other in order to express and share their emotion, a gesture of reciprocal confession from those with a common destiny. One of the questions that the peasant women, animators-actresses asked themselves in such circumstances was as follows: what to do in order to go much farther than the obviously sentimental relation that the play has built up? How to go beyond, all together, this emotional relationship? How to make this precritical awareness develop beyond the vibrant sharing of a common misfortune? What to do so that these spectators would be ready one day, not only to feel, but to think on their own and to act for themselves? Let us stress four lessons related to the street theatre in general. It has its initial success when it arouses the hearts by making the actresses and spectators vibrate in unison. Identification with each other is its first springboard. This identification was most effectively obtained, with regard to elder women, through the use of traditional songs which were already carrying related messages. Street play is not meant either for teaching or preaching, nor entertaining or 'playing', but for shaking up the emotional energy. How to go from dramatic action and psychodrama to a well thought out and organised social action? The urban educated women keep everything in their control. Peasant women like us, we must remain out of the game. I am not asking, like a beggar, that we should be given the power to decide. In our little GDS groups, we always bring our own problems; we ourselves take our own decisions; we carry them out ourselves. If this manner of working spreads, a real women's movement will exist. Such a movement alone will then succeed in placing the problems in their true perspective, and will correct the paths that are taken to solve them. The assembly greets these remarks without flinching. Many of the women assembled had been 'brought' there by urbanised leaders of social action groups and associations, who while addressing their speeches to the audience, kept them seated to listen to them, dumb and undoubtedly often with an empty mind. The fiery words of a peasant woman like themselves, suddenly revealed what they experienced, in their own language. On hearing their companions express their reactions later, the group of GDS peasant actresses realised that these women, taken charge of and guided, had quickly understood the message of autonomy addressed by one among them.